That unladylike snort… yeah, that was me. What does bother me is the fact that Mom and Dad pop in unannounced all the freaking time. Of all nights, why did it have to be now? To begin, Kaufman was an excellent addition to the Austin Arrows series. I absolutely loved it. It runs concurrent with Rush, the first book in the series. As such, you can read Kaufman if you haven’t read Rush yet and do so without any issues. With that said, if you plan on reading Rush, you’re going to want to read it before reading Kaufman to avoid spoilers because Spencer and Noelle are very involved in the goings on in book one. If you’re like me and have already read Rush, you might be rather surprised to discover just what Noelle and Spencer were getting up to while Ellie and Rush’s drama was playing out. 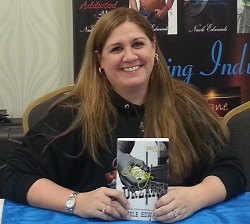 Being as Noelle is Ellie’s business partner and co-owner of the Penalty Box, and has been her best friend for close to 20 years, Spencer has known her just as long. But he’s never really “noticed” her in that way – she’s always been his sister’s best friend, and thankfully he’s never considered her to be like a sister (that would have been creepy). Fortunately for Noelle, that’s all about to change and she owes it all to The Secret. I kid you not, Noelle has a refreshing approach to life and appeals to the Universe regularly (and sometimes quite hilariously) to help her find happiness. While Noelle’s approach may come off as ridiculous to some, I had a friend who tried to utilize the ideals set out in The Secret, but he wasn’t as committed to it as Noelle (nor as successful) and I found this aspect of the story to be particularly endearing. While I’m not sure how much faith I put into it (then or now), I love that Spencer never ridiculed her for it, teased her a little maybe, but never tried to make her feel like an idiot. Yet even as they both professed that they didn’t want a relationship, that they were worried that their bedroom gymnastics could potentially harm the friendship they had, neither could resist the other. That’s how intense the chemistry was between them once the blinders were off. Without going into detail, so as not to spoil either book, Noelle and Spencer did not find a smooth path to travel as their non-relationship relationship progressed, but I wouldn’t expect it to either. Yet even as Edwards includes elements in the story that had me wondering how it was going to play out, I knew in the end it would all work out as it should because the author never fails to deliver. One of the things I liked about Kaufman, but that also confused me in the beginning, is that part of the story is told from Amber’s point of view. Amber is Spencer’s high school girlfriend who broke his heart and caused him to swear off relationships, and she also happens to be the team’s new assistant director of media relations. Having parts of the book told from her perspective had me questioning who Spencer was destined to be with, until it became clear why she was narrating as well. Having Amber’s perspective added layers to Spencer’s character and laid some rather scary groundwork for a future installment in the series. However, I don’t think Amber will be the one to find love next – I think that honor is being bestowed upon the team’s newest arrival, Heath Rush. Oh, yes, Kingston’s brother and it looks like he already has his sights set on someone who will make for an interesting test of wills. Kaufman is yet another Nicole Edwards hit and an excellent addition to the Austin Arrows series. 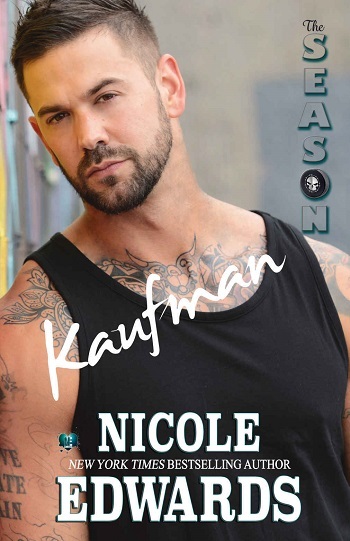 Reviewers on the Wicked Reads Review Team were provided a free copy of The Season: Kaufman (Austin Arrows #2) by Nicole Edwards to read and review for this tour.